Whether your car breaks down, your tire becomes flat, or your battery won’t allow your engine to turn over, car issues are the absolute worst. In an attempt to prepare for the inevitable, many people are opting for devices that make it easy and efficient to handle unforeseen car issue. Going out could be a lot of fun, it could be due to a lot of reasons like work, dropping the kids at school, visiting the clinic and so many more. But a little hitch can make it very frustrating. Imagine coming back to start your car and it won’t just reel because the battery has drained and its down. In such a situation, you might become really frustrated and may end up in a tight corner, you could call a friend for assistance or probably call a tow or maintenance service vehicle. But owning a device that can get you out of such situation in a snap is way more convenient, that is why you need a portable vehicle jump start device of your own which keeps a charge should you need a jump start to get you going. During an emergency, the jump starter offers a lot of help and gives you a way out of that difficult situation as a car owner. The jump starter can help you start your vehicle when your battery dies without notice or when the power is not enough to crank up your car engine. Also, some people are not aware that the car jump starter even though there are known to jump-start cars, they are in fact your best aid when your car tire is at the risk of deflation while on transit, you can use the air compressor to fill the tires when you are in the middle of nowhere or far away from car service centers. There are a lot of jump starters in the market today, however, we will be discussing the jump starters with an air compressor. A lot of people may not know about the extra features on these jump starters but by the end of this guide, you will be able to tell what you need when shopping for a car jump starter. Buying a jump start will double your peace of mind and it is money well invested, but when choosing a jump starter there are things you need to consider, a good jumps starter with air compressor should be easy to understand and operate, it should be durable with good battery storage, it should be portable enough to carry, it should also be safe to operate, the manufacturers play a vital role in your decision as the features of their product will likely swing your judgment and choice. Below are some common features itemized for you to consider when choosing a jump starter. When you are considering to buy a jump starter, one of the most significant factor is the power of the jump starter, it will be good to understand that for a larger engine which will require more power, the jump starter you will need will need to be more powerful as well. Although the definite amount of power required would be greatly influenced by other factors other than the engine size, eventually the determinant factor is still the size of your engine and the amount of power it will require for a successful jump start which will give you an overall idea of how much power you will need. Remember that there are different types of car batteries for different cars as the specification dictates, it is imperative to know the type of battery your uses, you should also know the electrical system of your car and the voltage it requires, that way you will get the perfect jump starter for your car. Some cars use a 12-volt electrical system while some cars still run on the 24-volt electrical system. It is also very important to have an idea of the wattage index (amp), through this you can know the power of the jump starter. There is also the peak amps and the cranking amps, the difference between the two is that peak amps refer to the highest amount of power that a jump starter can generate in an instant and for only a short period of time, this is generally said not to be the true measure of power. However, the cranking amps, on the other hand, generate and sustains the power of a jump starter for a period of time and is a more realistic measure of power. One thing to look out for in the market when shopping for a jump starter is one that comes with an air compressor, and the compressor should be of good quality because there are a lot of jump starters in today’s market with an air compressor. Although the main function of a jump starter is to jump-start cars, the inclusion of an air compressor is an added feature which has helped manufactures sell their products due to the versatility it brings. 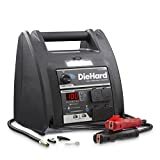 This is so because the combination of a jump starter and an air compressor brings more value as the most common car trouble vehicle owners face are flat tires and dead batteries. When you are choosing a jump starter, you should consider the ease of use, if it is easy to operate, easy to assemble and dismantle. You should know that in a case of an emergency when your car battery dies or your tire deflates and you are alone, you should be able to handle the task on your own and the device should be easy enough to use. 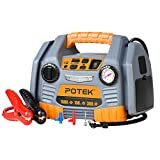 Portability is a very important aspect to consider when you are making you jump starter choice, you should be able to conveniently carry it around while it has enough power to complete the task. A too bulky jump starter would make things a little less comfortable when you want to use it. 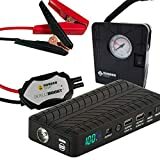 This point is crucial for those who would want to enjoy more value with their jump starter besides having an air compressor, some jump starters come with USB ports of 2.1 or 2.4 amps, AC adaptor for charging, compass, Flashlight (LED), digital display. Therefore, it depends on the features you are more interested in you can make your choice from the jump starter with your required combination. In conclusion, Jump starters are not new to the market and over time there have been a lot of improvement and added features to bring more value. To avoid being stranded by the roadside unable to drive, waiting for someone with a car and jumper cables to assist you, or calling the service company which could be miles away due to a dead battery or deflated tire, owning a good jump starter will save you a lot and with the verity of jump starters in the market today you can buy one which will serve other purposes while camping in the wild. Hope this guide will help point you towards the right type of jump starter.